Three rooms complete with design presented at Neues Museum sheds light on the topic of “East and West”. The series was kicked off with a room entitled: “DDR / BRD” – “East Germany / West Germany”. The German Democratic Republic, as East Germany called itself, was a state which in terms of political thrust, geographical spread and duration was very clearly defined and short-lived. From 1949 to 1990 Germany was divided into two states as a result of the Cold War, the political symbol of which was the construction of the Berlin Wall in 1961. The minds driving New German Design repeatedly emphasized this division. 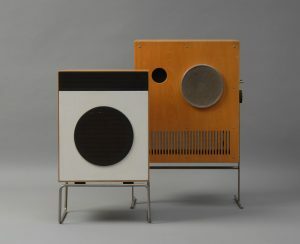 Everyday objects in East and in West Germany such as technical appliances and furniture, textiles and glass, or porcelain and packaging offered many a perspective on the two parallel worlds. A look back identifies objects that shaped the lives of entire generations: characteristic East German designs and typical West German efforts, each shaped by different living conditions and circumstances. While in the West products stand out for the variety of materials used, such as the furniture designed by Egon Eiermann, in the East, as the elegant watering cans by Klaus Kunis demonstrate, work hinged on a focus on the chemicals industry and thus on how best to use plastic. 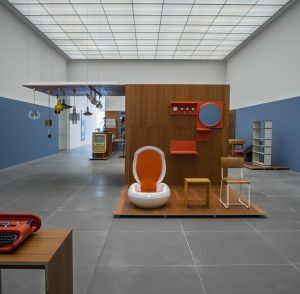 That said, in both East and West Germany the ideal of a matter-of-fact, minimalist formal approach prevailed, and thus objects in both countries were not so dissimilar in aesthetic terms. Manifest examples of this are the electrical appliances designed by Dieter Rams, on the one side, and Claus Dietel, on the other. What is possibly less known is that designs from the West also went into production in the East, such as the famous “Kangaroo Chair”. And companies like Quelle and Porst had products manufactured in East Germany for the market in the West, paying in hard currency for the work. From today’s point of view, design in East Germany can be considered especially creative and innovative as regards how it handled the lack of raw materials and resources. The display for the presentation DDR / BRD has been specially designed by Berlin artist Tilo Schulz (born 1972 in Leipzig). Since the early 1990s, Tilo Schulz has worked as an artist, curator, exhibition designers, and author. His work addresses issues of spaces and their in part imaginary contents. Developing, visualizing and changing an architectural space always also influences how people move in it, perceive it and experience it. In the museum, visitors encounter a new setting created by modifications to the display space that offers them far more direct access to the exhibits while also encouraging debate on the context, presentation and representation of everyday objects.